Many blame the school board for not holding former Superintendent Antwan Wilson accountable for overspending on administrative salaries and outside consultants. 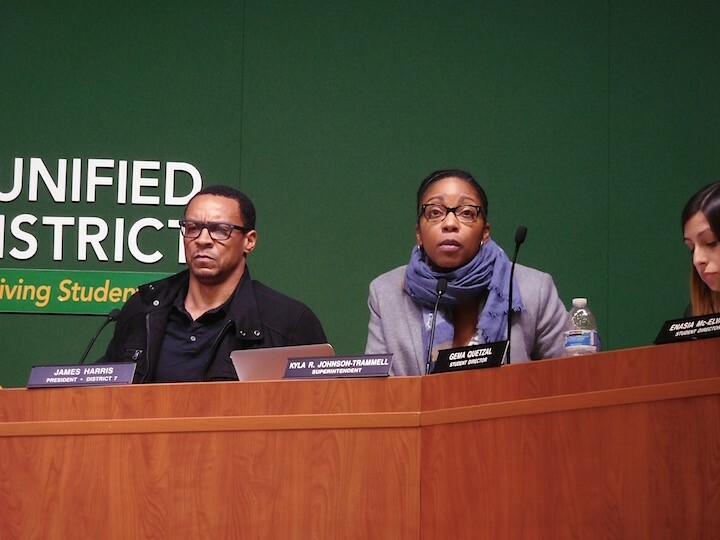 OUSD Board President James Harris and Superintendent Kyla Johnson-Trammell at last night's school board meeting. Students, parents, teachers, and employees of Oakland's public schools crowded into the La Escuelita Elementary School Auditorium last night to vent their frustrations about impending multimillion-dollar budget cuts. "We had to have a cleaning supply drive this year," Darcie Luce, the parent of a special education student at Emerson Elementary incredulously told the school board. Budget cuts and spending freezes implemented by the district earlier this year have prevented Emerson staff from using school funds to buy basic necessities like mops and paper towels. But Luce also said an assistant in the school's special ed program was cut, directly impacting her child's learning. High school students from across the district warned the board that new proposed cuts of as much as $15 million will "limit our chances of graduating." "My school, Castlemont, is one of the most under-resourced schools in this district," said Karla Briseño, a student organizer with the group Oakland Kids First. "Sometimes it feels like schools like mine don't matter as we are left behind." Fremont High School student Amelia Mendoza said her campus already endured a $900,000 cut last year leading to the closure of programs like the Mandela Academy, which prepared students for careers in legal and government service and public safety. "Asking for money back mid-year from schools is so disruptive," a 5th grade teacher from Chabot Elementary told the board. "There's not enough teachers in the classrooms," complained Aliyah Sulaiman, whose son attends an Oakland elementary school. "Our children's education is slipping away." The mother of a Frick Impact Academy student said she quit her job to volunteer at the school due to staffing shortages caused by prior budget cuts. She said further cuts would be extremely harmful. "When you guys make cuts to the budget, it doesn't just affect the kids," she told the board. "It doesn't just affect the teachers. It affects me and the community." Later in the evening, after hours of public comment — virtually all of them highly critical of the school board and administration — several directors apologized for the deepening financial crisis. "I'm sorry we're in this situation," said boardmember Jody London, North Oakland. "There are things I could have done differently." Boardmember Roseann Torres, Fruitvale, wiped tears from her eyes as she took some of the blame. "My daughter just graduated last year from Oakland public schools," she said. "In many ways, I failed my own child." Torres said the board has "voted like sheep" to approve fiscally irresponsible initiatives and spending requested by previous administrations. "I'm angry at this entire board for not governing better and not asking more questions of Antwan Wilson and Tony Smith," she said, referring to two former superintendents. Board president James Harris also took responsibility, but he defended former-Superintendent Antwan Wilson and said OUSD's problems are mainly "structural deficits" many years in the making, rather than over-spending by Wilson's administration. Many students, parents, and teachers disagree, however. They place blame on Wilson and the board for spending millions more on administrative salaries and outside contracts than was authorized in prior year budgets. "If I was to suggest anything," said Jun Kim, a Castlemont High School student who also organizes with Oakland Kids First, "it would be to cut unnecessary jobs created while Antwan Wilson was superintendent." The board has already voted to make approximately $15 million in cuts, but the exact amounts, and how they will fall on different schools, is yet to be finalized. The board's budget and finance committee will meet Dec. 6 for further discussion about the mid-year cuts. On Dec. 7, the full OUSD board will hold another discussion. And on Dec. 13, the board will take a final vote on a resolution to lay off employees and make cuts to school sites. See this week's print edition of the Express for more reporting about OUSD's budget crisis. Editor's note: this story was updated to identify three students who spoke at the board meeting.